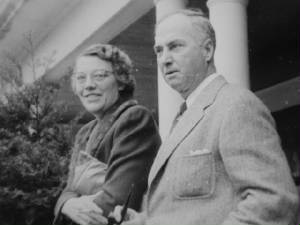 Douglas Campbell, born 17 July 1888, married on 26 May 1917, Marion H. Douglas, (1895-1981) daughter of Samuel T. Douglas and Marion Dwight, father of Doug, Jean, Marion, Jimmy who are all in the 1995 reunion picture. Great Uncle Douglas (Bop) and Aunt Marion (Nan) were my third grandparents and it was a special experience of being completely loved to be around them. He died on 22 July 1967 on the same day I saw him for the last time. I was in Jennings Memorial Hospital in Detroit for an operation for an unconfortable abcess in my lower back. Bop was admitted for tests and cancer was discovered. I remember visiting him the next day and he was his familiar upbeat self. I may have been the last family member to see him. Samuel T. Douglas was Marion's father. Click here for more. Douglas was the original owner of the family cabin now owned by the Farwells. Dr Silas T Douglas Marion's grandfather, dean of U of M medical school. Click here.